Did she or didn’t she? After almost 120 years the jury of history is still out. On a swelteringly hot day — the temperature was more than 37°C (100°F) — wealthy 69-year-old banker Andrew Jackson Borden (born 13 September 1822) and his second wife Abby Durfee Gray, 64 (born 21 January 1828). were murdered in their home — he in the living room, she in the guest bedroom. The Bordens shared their home with his daughters Emma Lenora, 41, and Lizzie Andrew, 32, and the servant Bridget Sullivan. At 11.10am Lizzie Borden screamed to the servant, “Come down quick! Father’s dead! Somebody’s come in and killed him!” He had been struck 11 times. Five minutes later, the body of Abby Borden was discovered. She had been struck 19 times and had probably been killed at 9.30am. The day before she was murdered Abby Borden had claimed that someone was trying to poison her and her husband but no evidence was found during the autopsies, which began at 3pm. Emma Borden returned home four hours later from visiting friends. That night the sisters stayed in their rooms while Uncle John Morse, their visitor, slept in the room in which Abby had been murdered. During the police investigation a hatchet was found in the basement and was assumed to be the murder weapon. A second autopsy was performed on 6 August. The next day Lizzie was spotted burning a dress that, she claimed, was despoiled by paint. That action led to her arrest on 11 August for murder. On 2 December Lizzie was charged with three counts of murder — the murder of her father, the murder of her stepmother, and the murders of both of them. 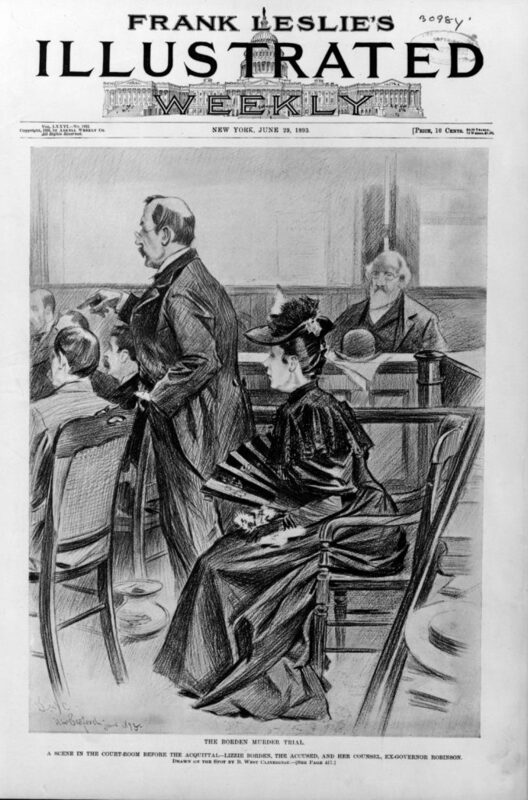 The trial began on 5 June 1893 and lasted 14 days. At 4.32pm on 20 June the jury returned a verdict of not guilty on all three charges. The theories of whodunit are numerous: Lizzie did it because she hated her stepmother; Lizzie did it during an epileptic fit which left her with no memory of her actions; Lizzie did it, helped by the servant Bridget with whom she was having an affair; Emma did it because she thought her father was about to cut her and Lizzie Out of his will; Emma did it with Lizzie’s help; Bridget Sullivan did it because Mrs Borden asked her to wash the windows; a local developer, Dr Sewell W. Bowen, did it because Andrew Borden opposed his building plans.